Jesus is alluding to Deuteronomy 30:14-19 (where the Lord sets out two paths, one of life and the other of death) which implies that this situation has two paths: one where the man’s full life, including temple worship, is possible, and one with a wooden examination for sabbath violations, ending with the goal of killing Jesus. Because the Deuteronomy text mentions cursings, Jesus is suggesting that the Pharisees have chosen to curse themselves by choosing (Jesus’) death over (the man’s) life. Jesus’ allusion makes clear that the Pharisees are on the side of the wicked, a truly remarkable accusation. Deuteronomy 30:14 mentions the mouth, heart, hands, and doing, all four of which are also mentioned in this story in Mark. In the Hebrew Bible text, references to the hand are prominent in the context of the violation of covenants as a result of failing to act; if this is paralleled to Mark’s text, it implies that the man with the withered hand is literally suffering the consequences of the curses of inaction, from which Jesus rescues him by his own action. As is typical in Mark’s healing miracles, atonement theology comes into play as Jesus exchanges roles with the man. Jewish tradition held that if there is any doubt concerning whether life is in danger, it is acceptable to heal on the sabbath—and the example offered is a sore throat! Since there is at least a hypothetical chance that the withered hand could cause the man’s death before the sabbath is over and it would show callous disregard for the man’s life to take the risk, healing him constitutes saving a life. And the objectors’ actions are all the more venal since Jesus’ healing was permitted under the law. “Life” is to be understood as “quality of life.” The man’s withered hand would have prevented him from participating in temple worship. So Jesus is not merely restoring a hand, but restoring his ability to engage in temple worship. This reading links this story to Mark 2:1-12, since restoring the man’s hand makes worshiping possible, just as the forgiveness in Mark 2:1-12 restores the man’s spiritual wholeness. “Save” can have a theological meaning in Mark. This would imply that Jesus’ miracle will increase the man’s faith and therefore “save” his soul—an action most appropriate to the sabbath. This reading creates a nice link to this controversy story’s chiastic partner (Mark 2:1-12), where the issue is forgiveness of sins. This statement is an example of exaggeration to make a point. Regardless of which interpretation is correct, Jesus’ reference to taking a life applies to the plot against his own life (see Mark 3:6). Obviously it is a violation to kill someone on any day of the week, and yet they are closely watching Jesus so they can level an accusation that will result in his death. In this sense, the contrast between his actions and theirs is clear: to any extent that Jesus is guilty of violating the sabbath, they are guilty of much, much worse. One implication of Jesus’ statement is that the categories that they have adopted (“do” and “don’t do”) create horrifying outcomes since the man can be left disabled on the sabbath but it is permissible to plan a murder. See Joel Marcus, Mark 1-8 (New York: Doubleday, 2002), 248. See Kurt Queller, “‘Stretch Out Your Hand!’ Echo and Metalepsis in Mark’s Sabbath Healing Controversy,” Journal Of Biblical Literature 129, no. 4 (December 1, 2010): 737-758. The parallel to “doing” is found in the man’s action of stretching out his hand. Joel Marcus, Mark 1-8 (New York: Doubleday, 2002), 252. See Adela Yarbro Collins, Mark: A Commentary (Minneapolis, MN: Fortress Press, 2007), 209. See Mark 5:34, 10:26, and 13:13. See N. T. France, The Gospel of Mark: A Commentary on the Greek Text (Grand Rapids, MI: Eerdmans, 2002), 150. This entry was posted in Julie M. Smith, Mark, Mark 3, Miracles on March 22, 2017 by Administrator. 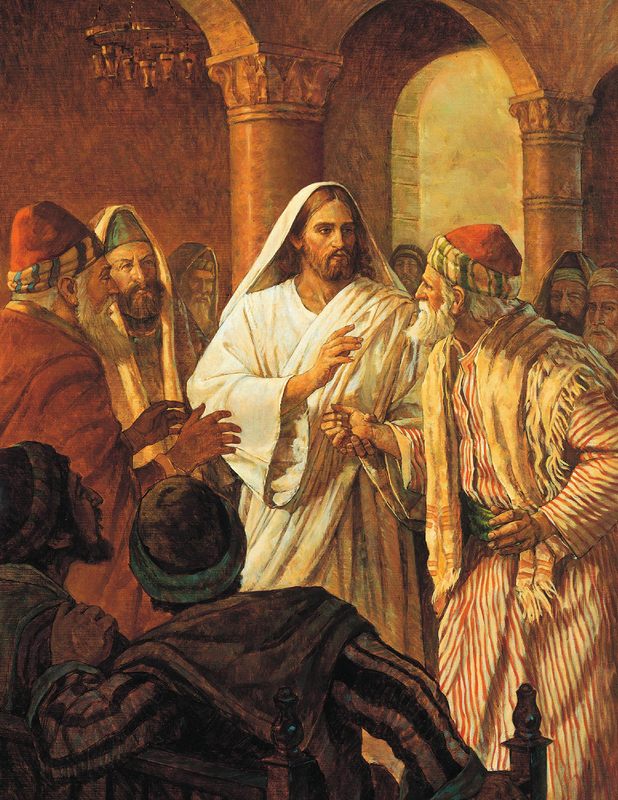 This post is taken from Dr. Huntsman’s blog: New Testament Thoughts. This entry was posted in Eric D. Huntsman, John, Miracles, Miracles of Jesus on February 1, 2015 by Administrator.